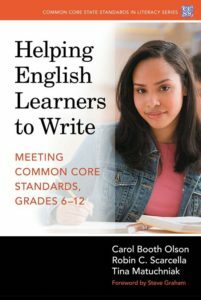 Summary: In this chapter from Helping English Learners to Write, the authors explain the critical role of narrative writing in helping English learners develop their English language skill and succeed in English Language Arts coursework in the secondary grades. Building upon a strong research-based rationale for narrative writing, it provides many specific and effective teaching strategies that would be useful for middle/high school teachers. In addition, this chapter would be of interest to teachers beginning inquiry projects. All students, and particularly ELs, have much more difficulty learning to write informational and argumentative texts when they have not first learned to write narrative texts. They have, in the past, had limited exposure to informational and argumentative texts and limited opportunities to discuss and compose them. Also, they often do not identify with the topics of informational and argumentative texts and lack the personal experiences and background knowledge to relate to these topics to the same extent as they identify with the topics of narrative writing. Hence, we discuss informational and argumentative writing last, given the challenges these two types of texts present to both teachers and students.